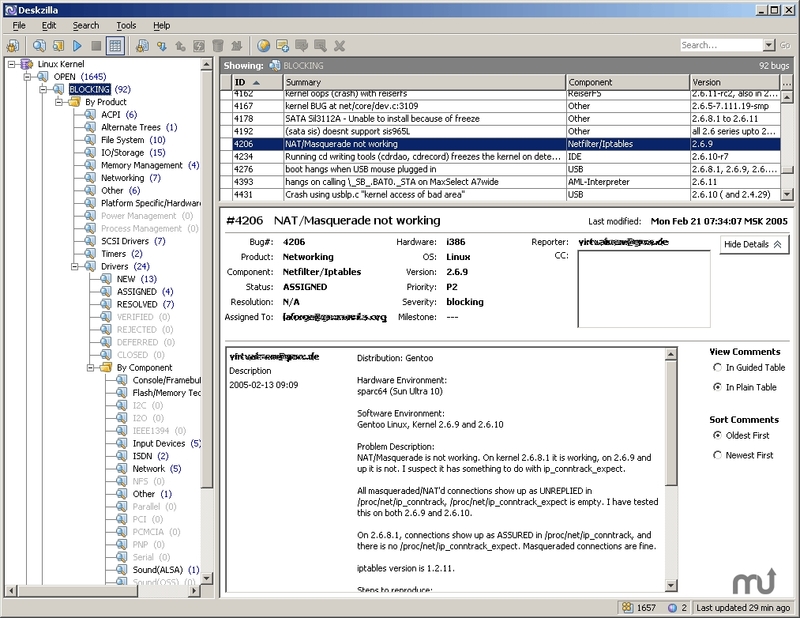 Desktop client for Bugzilla bug-tracking system. Is there a better alternative to Deskzilla? Is Deskzilla really the best app in Reference category? Will Deskzilla work good on macOS 10.13.4? Deskzilla is a desktop client for Bugzilla bug-tracking system.Deskzilla allows to examine a collection of issues through a hierarchy of filters that give the user an instant picture of the project status. This version fixes a startup crash on OS X Mavericks. Please note, however, that this version is not digitally signed, so you may need to disable Gatekeeper for the first launch. The release contains a fix for Bugzilla 4.2+, which ensures that all changes are downloaded by Deskzilla and are not missed. However, if you have a lot of changes happening on the server, it may lead to excessive repeated downloads. This is caused by Bugzilla disregarding time zone parameters in remote requests. Important: If you have Bugzilla 4.2 or later, you need to set up bugzilla.request.date.zone system parameter in Deskzilla to avoid excessive load on the server. Please see Time Zone Settings for Bugzilla 4.2 for instructions.